“Das Lustige Familien Quartett” published by Eugen Schmidt K.G., Dresden, c.1930s. Eugen Schmidt published several children's card games during the 1920s & 30s. In this “Happy Families” game, the families have comic names and their amusing antics are described in rhymes so that each set resembles a comic strip. The Gluttons, the Hardworking and the Sporty families can each be seen doing their things. Each family also has an appropriate icon. The artist's name on the box appears to read ‘H. Sachse’. 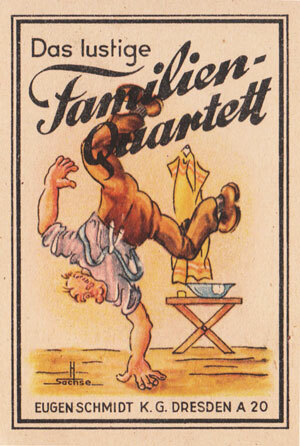 Above: “Das Lustige Familien Quartett” published by Eugen Schmidt K.G., Dresden, c.1930s. Images courtesy Rex Pitts.